As a kid raised in rural Arkansas, I lived on a small acreage on which we had various farm animals. My Dad went through a time of having some fowl that went beyond the norm. In addition to the regular farm fowl of chickens, we also had some pheasant. They were wild and crazy, always trying to fly through the roof of the pen. We had quail that were raised from eggs that we incubated. I don’t know if there is any cuter baby fowl than a baby quail. 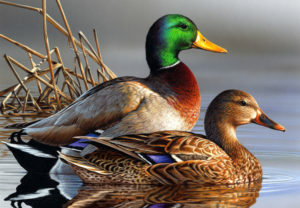 And, somehow, I don’t remember, we obtained 25 wild mallards that had to have their wings clipped to keep them around. A mallard duck is also a beautiful bird. We lived in an old, worn out house before we tore it down and built a new one. It had the old double hung, single-pane windows with the window weights inside that would rattle when you raised the window. I slept in the summer time with that window up for cooling with no screen on it. For some reason I got the bright idea that if I threw some corn out the window, it would be fun to watch the ducks eat and carry on. Early one morning I did just that, and sure enough those ducks found it and thoroughly enjoyed it. Well, next morning about daybreak, guess who was back at the window and guess who got fed corn again! This became routine. It seemed harmless enough. But then, it was realized that when it rained, with twenty five ducks outside your window putting out more than what they took in, a smelly loblolly was created. Plus, no matter if you wanted to sleep in, twenty five ducks outside your bedroom window at daybreak, demanding their breakfast, is not conducive to deep, blissful sleep! Eventually the ducks got hauled off to a friend’s large pond, but the lesson I will never forget. We can engage in something that seems fun and harmless enough to only learn that there are consequences in the end. Feeding your ducks might be fun for a while, but the Word will stand true, sooner or later we will reap what we sow (Galatians 6:7,8). The good news is that through what Jesus Christ has done for us, we can sow into his kingdom and reap eternal good. Are you caught in the trap of enjoying the pleasures of sin for a season? (Hebrews 11:25) Repentance and faith in Jesus can get you out of the trap, although the consequences might still be in place. If you don’t want your life to have a disturbing, loud, mess on your hands, then don’t feed the ducks out of your bedroom window.